I’ve been on a mission recently trying to ensure that all that we do at the Dental Office is done for a purpose, and done with a purpose. By this I mean that everything, and that includes everything we say, should be *calculated* with an end result in mind. Put simply, as an employer or business owner, you wouldn’t tolerate one employee, let alone a group of employees, to be wandering around aimlessly throughout your office doing nothing in particular for no specific reason with no desired outcome? Because that would be an entirely pointless waste of money. Watching employees walking around doing nothing would be like standing there just tearing up a pile of hundred dollar bills. It just would not happen. But I challenge you that within every Dental Office the practice of doing nothing in particular is happening every day. Because it’s happening in conversation. Day in and day out there are conversations happening within your office that have no purpose at all whatsoever. And while these conversations and discussions about fluff drift about aimlessly in your office they prevent purposeful conversation from being had. What are the topics of discussion that have no point whatsoever? Well, that’s easy to categorise. In the first two instances, a topic is fluff if it is about something we cannot change, or it is about something that is a constant. The weather is something we cannot change. Conversations about the weather for the weather’s sake are just fluff. They go nowhere, and are pointless. Listen to people talking about the weather. Comments like these start nowhere and lead nowhere. And don’t get me started on conversations about constants. Because time is a constant. An hour is always an hour. A week is always a week. Whether it’s a week at the start of the year or a week in the middle of the year. Put a stopwatch on it….it still takes the same amount of time. So if we eliminate fluff from our Dental Office conversations what should we be talking about instead? And what should we be doing if the patients start talking about fluff? The purpose of all conversation in the dental office should always be about the patient. And that’s an easy topic to remember. When we talk to someone, anyone, about them, we are talking about their favourite topic. And once they get going, all we ever need to do is just keep asking relevant questions. And they’ll keep on talking and talking and talking. The purpose of getting people talking about themselves is that it allows us to collect *Customer Intelligence* information about them that we can then record and disseminate amongst other team members at a time in the future. When one of our team members then uses that information at a future appointment to begin a conversation with that patient, the patient feels even more important. The unexpected use of this collected information has the patient in awe! So how do we begin a conversation and avoid the fluff? Ask a question about them specifically. And ask in a series of questions so that if you get some not so enthusiastic answers, you can push through the wall of defence and still continue on to the information of gold we require. And remember, that the person asking the questions is the person in control of the conversation. So what should we do if the patient starts the conversation talking fluff? We ask them a question. We ask them a question that leads away from the fluff and back to them. If they open by talking about the weather, ask them if [that weather] has prevented them, or will affect them doing something. And then we are immediately off the weather and onto a topic about them. And straight away we’re again onto them. If you’re looking for a topic to start talking to your patients about, use the acronym F.O.R.D. to stimulate discussion. When we think in these four categories, it’s easy to start a conversation with our patients about them. • Do you have family? • Do they live nearby? • Have you been there long? We call this line of questioning the gathering of specific Customer Intelligence. ▪ A recent event that we may have in common with the patient. So cut out the fluff…. Have every team member on a mission each day to collect and acquire a certain specific amount of Customer Intelligence Information about each and every patient. And once that information is learned, make sure that it is recorded and also shared with other team members, so it can be used in the future when that patient returns for their next visits. Establish a culture within your dental office of collecting and sharing Secret Service Information and Customer Intelligence gathered about each and every patient. Being interested in your patients will have them feeling that you too are interesting. Unprompted recollections of Secret Service Information and Customer Intelligence by you and your Dental Team are the easiest ways of telling your customers that you hear them, that they are Important! Make this collection of Customer Intelligence a part of your culture, and you’ll have your clients raving about you and your office to all their friends and family. Having purpose to your conversations will raise the bar, and will set your dental office well and truly apart from all other dental offices in your area, because nobody else is doing this!! Sadly, in every profession, there are always those whose behaviours disappoint in the eyes of others in that profession. And lately, I’m being reminded that in Dentistry, there are those who will disappoint because of their actions. And I may be one of those disappointers. Sure I’ve had people tell me that my marketing for my coaching is a little too “out there”, but heck, if you don’t like my marketing, then throw it in the bin and get on with doing what you are doing…. Those of you who have read my Special Report will know that I was sacked over the phone by a Dentist who employed me, for being of all things, left- handed. And of course, there’s the now timeless tale of the first consultant that I started working with at my Dental Office, who was at the same time was setting up practice with one of my competitors just 900m down the road from me! It’s interesting because both these acts of vulturism involved Napoleonic divide and conquer as well as acquisition at all costs mentality. Instead of believing in the theory of abundance. The theory of abundance believes that when we think *abundance*, no matter what we are thinking of, there will be more than enough of it for all to enjoy and have plenty. My most recent example of vulturism that I have recently heard of has come from a friend who is in the market for buying a Dental Practice. And I must say, after listening to his tale, and the tales of another colleague recently, there’s one simple lesson to be learned straight away…. A serious vendor will have a contract of sale, and use an agent. Sure, the agent wants to sell everything he lists, so you need to be alert there. But dealing with a vendor, and let’s call them a water-tester, who hasn’t really truly committed to the sale, is fraught with emotional dramas and exasperations. A friend of mine contacted me about two such water-testers that he had met. Now my friend had written to a targeted list that he created of dentists he thought might be wanting to sell their Offices. The first dentist who responded had what looks like, a really great practice. The practice employed associate dentists, and enjoyed healthy collections. But the water-testing vendor wanted to sell at a price based on future potential, whatever that means. And my friend was also concerned that the rental for the rooms, which the vendor owned, was several shades, many shades higher than market rent. So interestingly, as time elapsed, this vendor became more and more vulturistic…. My friend also spoke to a periodontist who was willing to sell my friend his rooms, and stay on as an employed periodontist on commission. The rooms were nice, but the thought in my head was that most specialist practices are unsellable, because the specialist has built up his own list of referrers, and when the specialist goes, those referrers on the whole will refer to their B and C specialists, never to the new guy. In both these instances, sadly for my friend, his enquiry had brought out some vultures. I’d tend to think that if buying, we need a commitment to sell from the potential vendor. Before Active Dental, I worked for three years as an associate dentist for a dentist who told me virtually from Day One, that if I played my cards right, there’d be opportunity of a buy in because my employer was approaching retirement. And during my third year there, I would often ask about that buy in opportunity, and it’s possibility, only to have my question brushed aside. Although this talk of buy in was a false, fluffy offer, if it had had some legs, I would have been happy to stay on there. My employer was a fair man, and I learned a considerable amount about the business of dentistry, more by osmosis, while I was there. When I begin my coaching agreements, about half of my four pages of paperwork explains how each party can end the agreement, and continue the agreement, if need be. Because it’s much easier to discuss the pre-nup before the relationship as opposed to discussing it during the divorce. And interestingly, the responses to this clause by potential clients has actually acted as a filter to separate out those who really want to grow their practices from those thinking on a scarcity mentality. Which I’m sure saves me a lot of anguish down the track..
And I’m good with that sort of filter..
BTW, One of my clients sent me an email last night that she’d just had a PB week of collections this week, so after eight months, the growth in her practice is still continuing. Eyes wide open rather than blinkers on. For my friend who is looking to buy, a new job as an associate dentist fell into his lap, so there’s been a happy ending there for him. Or a happy turn of events. I think my friend benefited from running those two practices by me, so that I could help him see the possible dangers. And he worked those dangers out for himself…I was just his sounding board. Finally, in passing, I’ll mention a dentist I know well who just this week pulled the pin on a good practice because of vendor, or water tester, family issues. My friend pulled the pin immediately as soon as he found out there were family issues. If the sale or purchase is conditional on something relating to family issues, that’s a big elephant in the room that you don’t want. So my friend was out of there. In dating, there’ll always be other girls and in dentistry there will always be other practices. Think we know our patients? An interesting email came across my desk his last week…. The writer of the email lives in Florida. point… I stopped going to the dentist for 2 years. online… and treat your staff better. Firstly, despite what we as Dentists like to think, Dentistry is a *Grudge Buy*. Not many people enjoy going to the Dentist, even when it’s a regular visit, and even when there’s the likelihood of not much, or nothing, being wrong. Secondly, for those regulars, we need to spend the time with them. Even though we know there will probably be no restorative work to do on them, it’s important to make sure we are thorough in our examination with them, and that we also give these patients value for their time. And adults spell “Attention” the exact same way. T.I.M.E. Take the time with your long-term patients. Spend time with them visiting with them. Don’t just do a drive-by examination. Thirdly, run your hygiene department to time. Don’t keep your hygiene patients waiting. A dentist friend of mine from Baltimore told me that he recently changed Dental Offices because the hygienist continuously and constantly kept him waiting for his hygiene appointment. And my friend goes four times a year because of a cleanliness issue, not a periodontal issue. And this office belonged to a friend of my friend from Dental School. Remember, the number one reason in business, in any business, that clients take their custom elsewhere, is Apathy, and perceived Apathy that they are displayed by employees within that business. Finally, in this day and age, take more payment options. And don’t begrudgingly take them. Work out your numbers, and adjust your fees one time across the board so that your business silently collects sufficient to cover the cost of those merchant fees. Then set and forget them. The feelings and concerns of clients, customers and patients of our Dental Offices are very much like those expressed by my Floridian friend in this email. Just because we as dentists do not see this sort of correspondence so much does not mean that this is not happening in our world. And we need to be aware of that elephant each and every time we see all of our patients. The True Business Of Dentistry…. Dentistry is not a business about products or services. You see, I’ve just this week returned from a two-week trip to the USA, where I attended three conferences on Dentistry in the space of ten days. Three conferences. Six days of learning. Three different cities. West Coast. Central. And Florida. And the over riding theme of those conferences was this. It’s a business about people. And sadly, most dentists do not get this. They believe by learning new skills, by being more competent and clinically proficient, that patients and customers will come flocking to their offices in search of them. Sadly, in reality, that is not true. Yes, sure, you need to have some reasonable skills of Dental Dexterity. You cannot be all thumbs when it comes to the intricacies of performing fine Dental Skills. And your patients can sense that physical competence while you are actually engaged in the Dental Moment, of performing a procedure in their mouth, right there and then. However, what your patient buys from you time and time again is your level of professionalism and courtesy towards them. And how your team makes them feel. And how your Office makes them feel. They buy these factors way more times than they buy your competencies, proficiencies and dexterities. And sadly, most dentists don’t know this. And if they do know this, if they get told it, or if they work it out themselves, there’s often a big chance that they still just file this information away in the vault and never take action about it. And because of this, because of this focus on clinical skills rather than people skills and relationships, great dentists are not being rewarded appropriately for their competencies. Because the marketing of ourselves, the marketing and presenting of us and our team to our clients, customers and patients, as well as to the general public and the whole wide world that we know; this marketing as I call it is paramount, it’s the lynch pin, it’s the key to greater business success. And success in business, in the business of dentistry is a good thing. Being rewarded appropriately by our business so that we can live and lead a comfortable life should not be seen as a bad thing. Why shouldn’t we be able to live where we want? Why shouldn’t we be able to send our children where we want for their best education? Why shouldn’t we have saved sufficiently for our retirement? And why shouldn’t we have enough comfort in our working life that we can give benevolently of our time, procedures or funds, when we so want? Sadly by conformity to societal norms, we as a profession are often guilty of depriving ourselves and our families of the appropriate rewards we deserve for the investment of time, money and resources that we ourselves have laid on the line to get to where we are today. How many years of seriously difficult study did it take for you to become a dentist? How long in years did it take for you to acquire that D.M.D., that D.D.S., that B.D.S., or that B.D.Sc.? Once you had your shingle, how much money did you invest into either purchasing a Dental Office or building a Dental Office? And how long did it take you to repay that loan? And what sort of return, or R.O.I. could you have gotten on that money if you had invested it wisely in the stock market or in real estate? The overriding message, or theme from all three meetings was that it’s about having the right team, and having the right customers. That creates that great business. “It doesn’t matter how good a doctor I am, if the patients don’t like you.” – Neil Ross M.D. “It doesn’t matter how good the baker is if the cashier spits on your cake.” – Laurie Guest C.S.P. Is someone on your team, even you, spitting on your client’s cake? That means messing up with each other as well as messing up with your clients and customers. What are you doing, for your business, for your customers, to make sure that they receive the best experience possible? 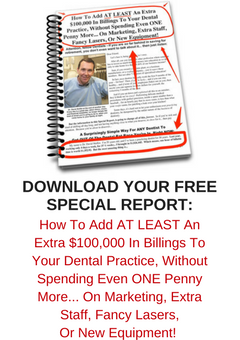 Two Ways To Keep More Patients And Really Save Your Dental Practice Money. If your car has a leaking radiator, it makes no sense driving along and refilling the coolant at the top while there’s a hole dripping coolant somewhere lower down. It’s the same with tyres. It is very dangerous to drive a car with a slow leaking tyre. Apart from the inconvenience of having to stop and keep adding air, there’s the chance that if you keep on ignoring the leak, the hole leaking air will expand to create a real-life blow-out! And yet, in our Dental Offices, there are a lot of dentists doing exactly that same thing when it comes to managing their patients. These dentists are leaking patients out through small holes in their systems, and they don’t even know it. Or they kind of know it, but they’re happily or ignorantly turning a blind eye to these leaks. Because they’d rather manage the problem by adding more new patients at the top of their Dental radiators. The trouble is, that with radiators and tyres, what’s leaking out is inanimate coolant and inanimate air. Whereas with Dental Offices, the patients leaking out are real live humans, with mouths and brains and hearts. And they’re going to talk. And that won’t be good. You see the air that leaks out of your tyres doesn’t go telling the rest of the air about your lousy tyres. And that’s the tragedy of Dental Office ownership. Patients leak through the cracks in our appointment books and sometimes we don’t even know why. And most times we don’t even know how much the true cost of this loss to our Dental Offices actually is. Truth be known, most times we probably don’t really want to know. When air leaks out of our tyres, when coolant leaks from our radiators, we take action. We replace the tyre. We fix the radiator. Because the subsequent damage of ignoring these leaks is devastating! The number one reason that patients leak away from our Dental Offices is apathy, and perceived apathy, shown toward them by Dentists and Dental Office staff as well. I recently spoke with a dentist who identified he had some leakage that he needed help with. Patient retention, or client retention, should be a primary goal for all Dental Offices. All Dental Offices should be trying to reduce and minimize and eliminate the leakage of patients through the cracks in their appointment books. Because of the costs of replacement. Appointments need to be kept, and not rescheduled. Even if the appointment is rescheduled, the cost to the office in time, energy and anxiety needed to fill that space just created is quite large, when you really consider it. And this cost can easily be reduced with better systems and protocols in place. No appointment should ever be cancelled. Every appointment is made for a reason. Dental appointments are not like dinner parties. Dental appointments are to remove decay and fix patients’ problems. Appointments cancelled and not rescheduled cost time in follow up. Employing someone just to spend time following up these cancellations is a drain on practice resources. When you add up all that follow up time, the person employed to follow up could be gainfully employed to be doing something else in the office that is far more productive. Spending money on new patients to replace patients that leak out of your office because of your lack of systems costs more than just dollars. Because there’s the extra time required by the whole office to build rapport with the new new patient replacing the lost patient. There’s also the time taken to diagnose, and present treatment options and treatment recommendations to the new new patient. Time taken by the whole office. It just makes no sense at all to be throwing good money away at extra marketing for extra new patients just to replace those patients forming a conga-line straight through your cracks in your Dental Office. Fixing those cracks, and fixing them permanently makes much more sense. And fixing those cracks is easy. But it requires two things. Firstly, you need metric systems. Metric systems that are practical, and tight. Metric systems that make sense. Remember what gets measured gets done. And what gets measured gets improved upon. Secondly, people like doing business with people they like doing business with. So you need to look at your Customer Service Systems. What you’ll find is that there are holes or inadequacies within your delivery of your total Dental Product that are letting your Office down. But they are still holes nonetheless. Because it doesn’t matter how great your systems are, if some of your people are not the best at relating to your customers, you’ll always have issues. Raising the Customer Service Awareness to front of mind is paramount in reducing the leakage and in improving patient retention in your Dental Office. Fixing those leaks and making those necessary changes will raise your Dental Office to be *THE* Number One Go-To Dental Office in your area.